Colours: gum ball green, whisper white, and raspberry ripple. Emboss the white card stock with the Chevron Embossing Folder using the Big Shot Machine. Stamp in Raspberry Ripple and cut out two Keepsake Ornaments using the framelits dies and the Big Shot. Tie a Gumball Green stitched satin ribbon around the white card stock and adhere to the Gumball Green Card (half a letter-sized sheet). 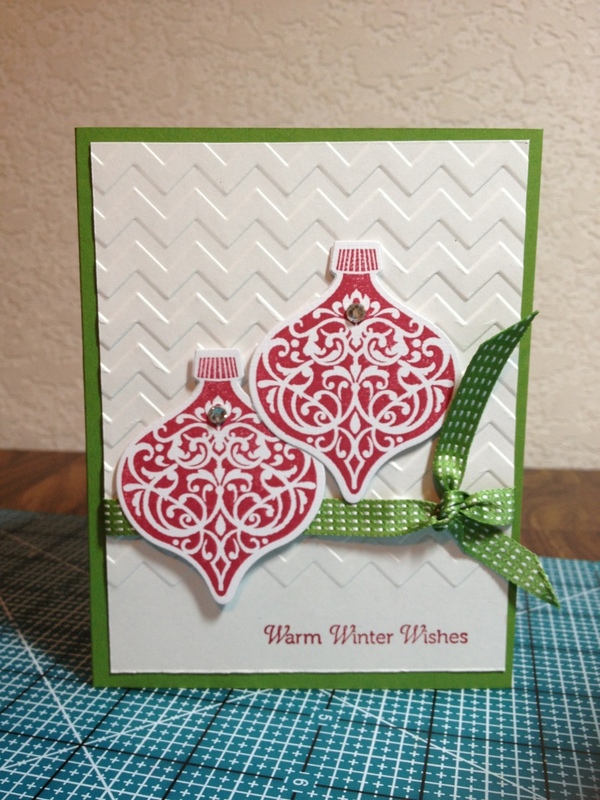 Stamp the Warm Winter Wishes in Raspberry Ripple onto the white cardstock. Use a sparkly rhinestone to embellish each ornament. Adhere a white cardstock liner inside the card. And you’re done!